Affordable Skin Care Solutions: RHINO SKIN ARMOUR was founded on values of RHINO Rugby: reliability; toughness; performance & integrity. All Rhino Skin Armour products have been carefully researched and loaded with the latest multi-active ingredients to offer real results, making them a kit bag essential for any weekend warrior. It should also be noted that none of these products contain SLS or parabens and they are not tested on animals. When a key representative from Rhino Skin Armour kindly offered to send me some of this range, I was fairly excited by the prospect of trying them out. I have played rugby over the years and so was especially interested to find out how the Rhino Skin Armour range would work for male skin that is accustomed to vigorous activities. 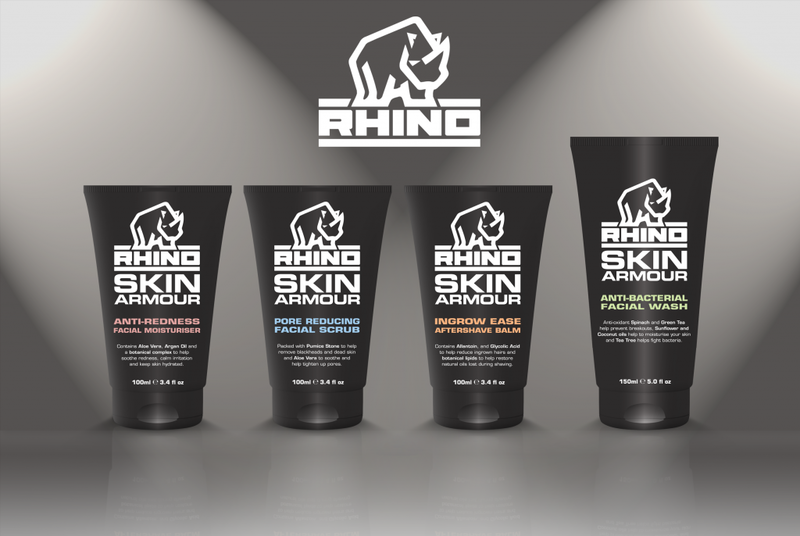 The Rhino Skin Armour range consists of four products: Anti-bacterial Face Wash; Anti-Redness Face Moisturiser; Pore Reducing Face Scrub; In grow Ease Aftershave Balm. The two products sent to us for review were the Anti-redness Facial Moisturiser and the Pore Reducing Facial Scrub. If I'm completely honest, these were the two I would have been most interested in trying anyway, so it worked our pretty well. For men that tend to suffer from facial skin redness or razor burn, this Anti-redness Facial Moisturiser could well be of interest to you. This formula contains Aloe Vera, Argan Oil and a botanical complex to help soothe redness, calm irritation and keep skin fully hydrated. The additives are great, and for under a fiver this is a must try product for any man looking to get the best out of his skin. The texture of this Anti-redness Facial Moisturiser is fairly light/thin, allowing you to absorb easily into the skin. The scent is pretty good too - a very rich cologne type fragrance - certainly a very 'manly' scent. The next product I tried was the Pore Reducing Face Scrub. As many of my regular readers will know, I just love my face scrubs. Face scrubs have been an integral part of my grooming routine, therefore I was particularly looking forward to trying this product. The Pore Reducing Face Scrub is well formulated and consists of a light texture with a transparent appearance. The scrub has a medium grain percentage and is fragranced with a rich cologne- but not too overpowering. This face scrub is packed with Pumice Stone to help remove blackheads and dead skin and Aloe Vera to soothe and help tighten up pores. I found this face scrub to be pretty decent, especially when you take into account it is priced at just £3.99 and can be purchased from Tesco, as well as the rest of the Rhino Skin Armour range.